Do you love having fresh flowers around your house? Are you tired of wasting your money on grocery store flowers that don't last? Well we have a solution, now having farm fresh flowers displayed around your home just became a whole lot easier. With our monthly subscription boxes you can now get the most fresh flowers delivered straight to your door. In the middle of every month you will recieve a single variety bouquet of the most beautiful flowers. These bouquets will vary month to month and you can expect to see flowers such as, roses, lilies, hydrangeas, gerber daises, sunflowers, tulips and much more. Along with your box you will also recieve a package of food for your flowers to make them last even longer and an instruction card specific to that months flower. You can get the box for yourself or theses boxes make the perfect gift for a friend, family member or significant other. Sign up with no long term commitment with our month to month subscription or try our 3, 6 and 12 month subscriptions and receive a small discount! Signing up is easy, all you have to do is fill out the form below and a team member will be in contact soon! Save by not paying for the delivery or a vase that you will never use again. Custom arrangements created just for your style and space. Exclusive flowers and vases available only for our subscription customers. 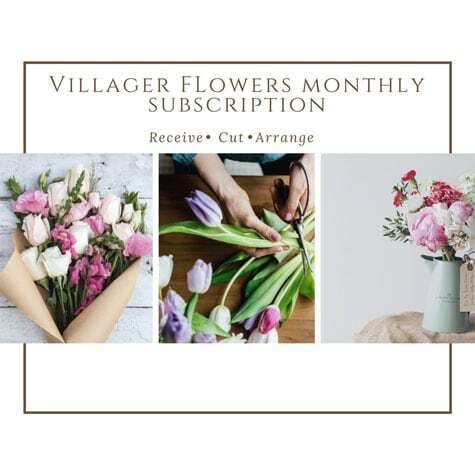 Interested in learning more about a Villager Flowers Monthly Subscription? Fill out the form below and a representative will contact you shortly to discuss your needs.